Incence, Frankinsensce and Myrrh? It’s Perola flour and coffee on this advertising sheet. Svatava Vizinová in her Zábrdské Betlémy Museum amidst her beloved nativities. Svatava Vizinová devotes her life to her Zábrdské Betlémy Museumin the mountains of Bohemia, the Czech Republic. Svatava surrounds herself with crèches, she says, because, “the theme is magic, charming, strong. “I send you some little things now,” writes Svatava. “You can see the ‘logo’ of firms and products. This crèche was printed in the 1930-40s. I think it is a Czech Specialty, given out by merchants at Christmas. Well, Svatava, one of them, Professor Karel Zimmermann, has been sending me all those wonderful photos of your Museum and your collection. Another child at heart, who got his crèche sheets as Christmas presents as well, but from his dad, is now making your Perola Advertising Crèche available as a free Download on Crèchemania.com. Look at all the chickens, cactus, rabbits, roosters, sheep, ducks, squirrels, plants, rocks, colored eggs — even a watermelon slice! — packed in this advertising nativity sheet! Czech merchants would hand out nativity sheets at Christmas, and that's where this beautiful Perola Advertising Nativity sheet got is "advertising" moniker. 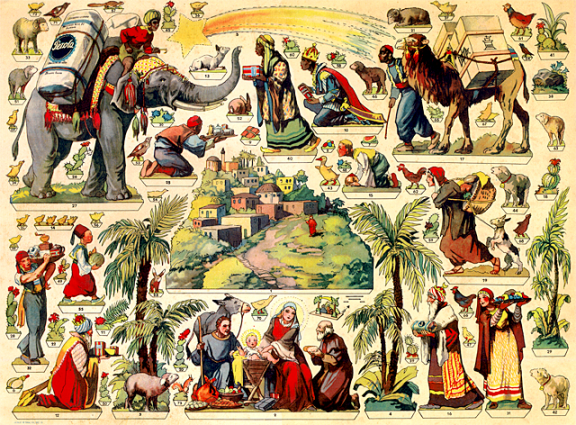 Certainly, it is a celebration of The Nativity, but it is also an advertisement for Perola flour and coffee: a camel is laden with two large crates of coffee; an elephant is dwarfed by two huge bags of flour; a turbaned woman rushes with a tray of coffee; a Magi approaches with with a bag of flour; and, since advertising is all about repeating the message, even a shepherd offers a loaf of bread. How, one wonders, would today's politically correct world perceive this "advertising" element in a nativity scene? I hope with delight, bearing in mind that all are welcome at the manger—flour and coffee manufacturers included! If nothing else, this lovely nativity sheet is a reminder of simpler times past. Download and print the Perola Advertising Nativity on heavyweight, matte, paper. You’ll need a printer that will accommodate a 13” x 19” sheet, or print the Perola Advertising Sheet in pieces or at a reduced size to fit on letter-size paper. After cutting out, assemble your nativity on a construction-paper "floor,"a soft-green color would work nicely,arranging the pieces as you like. (You may also glue the individual pieces on foam-core or balsa wood (that can be sliced easily; careful with that X-acto knife!) and set up your nativity as a table top scene. Feeling adventuresome? Use a proscenium from a toy theater, and create a theater crèche. Grazie del bel presepe, spero di riuscire a realizzarlo. Unfortunately, I couldn't download the nativity sheet. Franck had dozens of factories in the Western world for grain and cichory coffee befor the Great War. Between the two world wars, in Germany Franck made advertisement with little pictures to collect, while the factories in the First Czech Republic presented cribs to the customers. The little boys stuck sticks on the backs of the figures and put them in the moss in between the windows, so people passing by could look at them. (In winter, the Bohemian winds are so strong, that there had to be an outer and an inner window, and poor people insulates the space in between mit sphagnum.) After the war, the German expellees and refugees still remebered this. Thanks, Robert. And do let me know if you haven't been able to download this sheet. Hello Thomas, Your download will expire after an hour, so please make sure you have your copy saved before that time. A nativity sheet to cut-out and arrange as you like, from Svatava Vizinová and ZÁBRDSKÉ BETLÉMY.